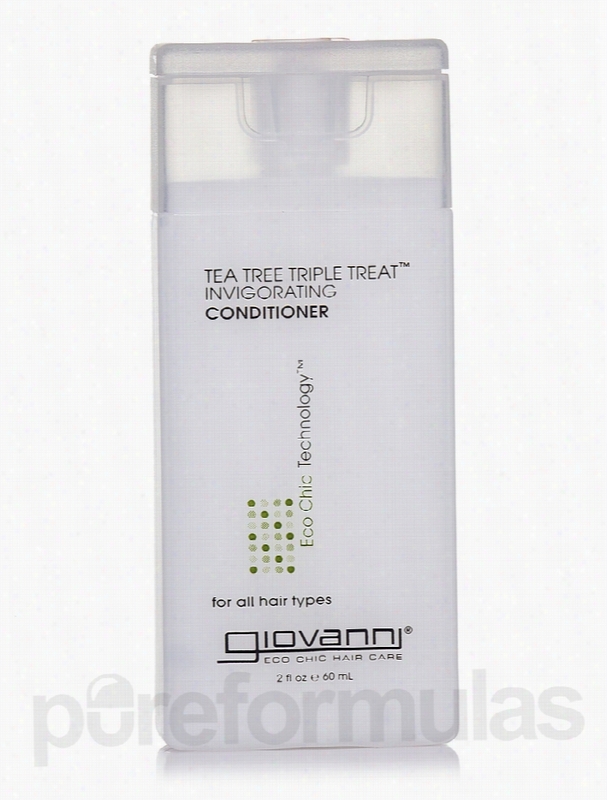 Giovanni Cosmetics Hair - Tea Tree Triple Treat Invigorating. Improve scalp health and strengthen your hair with Tea Tree Triple Treat&trade; Invigorating Conditioner 2 fl. oz (60 ml) from Giovanni Cosmetics&reg;. This organic hair care formula may condition your scalp to maintain healthy and shiny hair. Aloe Barbadensis or Aloe Vera leaf juice&sbquo; a rich source of important vitamins and Minerals&sbquo; appears to soothe the scalp&sbquo; prevent hair loss&sbquo; and promote hair growth. The polyunsaturated fatty acids in safflower oil or Carthamus Tinctorius could potentially provide nutrition to your hair&sbquo; and keep it hydrated and protected. It may also improve blood circulation and support the growth of new hair. The anti-inflammatory and calming properties of Chamomilla Recutita help alleviate scalp irritation and other conditions. The presence of silica in Equisetum Arvense extract may add life&sbquo; shine&sbquo; and strength to your tresses&sbquo; making them healthy and manageable. Tea tree oil in this hair conditioner from Giovanni Cosmetics&reg; could potentially nourish your scalp and hair&sbquo; unclog hair follicles&sbquo; reduce dandruff&sbquo; and alleviate hair fall. Extracts from rosemary leaf&sbquo; thyme&sbquo; nettle&sbquo; eucalyptus&sbquo; sage&sbquo; and lavender in Tea Tree Triple Treat&trade; Invigorating Conditioner 2 fl. oz (60 ml) from Giovanni Cosmetics&reg; may keep your scalp and hair nourished and conditioned. These statements have not been evaluated by the Food and Drug Administration (FDA). These products are not meant to diagnoseÃ¢ÂÂ treat or cure any disease or medical condition. Please consult your doctor before starting any exercise or nutritional supplement program or before using these or any product during pregnancy or if you have a serious medical condition. 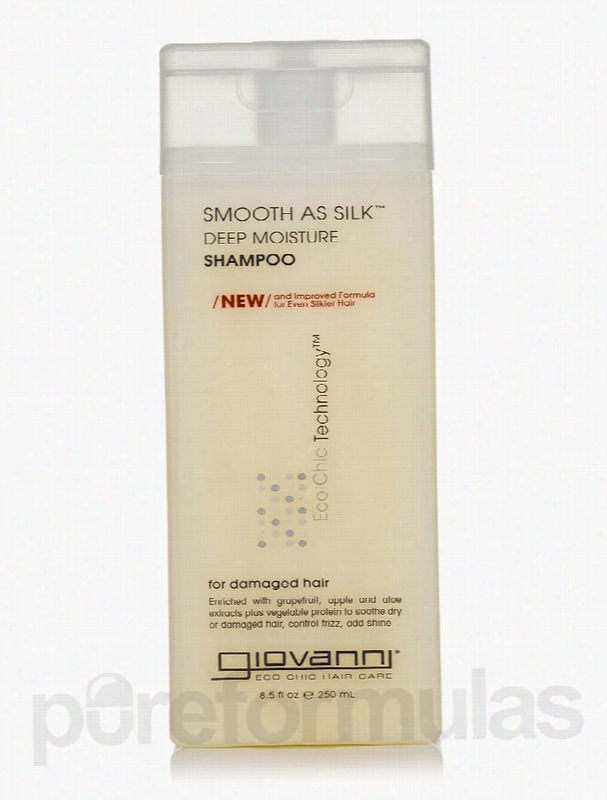 Giovanni Cosmetics Hair - Smooth As Silk Shampoo - 8.5 fl. oz (250 ml). Add life and shine to dry&sbquo; damaged&sbquo; and unmanageable hair with Smooth As Silk&trade; Deep Moisture Shampoo 8.5 fl. oz from Giovanni Cosmetics&reg;. This organic shampoo contains natural extracts from sea kelp&sbquo; mango&sbquo; Echinacea purpurea&sbquo; soybean&sbquo; and Valencia orange. Pyrus Malus or Apple fruit extract&sbquo; with antioxidant properties&sbquo; may strengthen your locks and protect them from dandruff and damage. The antifungal and anti-inflammatory properties of Aloe Vera leaf juice appears to soothe itchy scalp and reduce dandruff. It may unclog hair follicles&sbquo; promote new hair growth&sbquo; and control frizz. Grapefruit extract in this shampoo from Giovanni Cosmetics&reg; may reduce hair loss and encourage hair growth. It reportedly maintains moisture balance and adds shine to your mane to keep it healthy and detangled. Lemongrass extract&sbquo; lavender&sbquo; and rosemary leaf extract could potentially strengthen your hair follicles&sbquo; decrease hair fall&sbquo; and deal with oily hair and scalp conditions. These herbs appear to add volume and moisture to your tresses and keep them healthy and manageable. Ginkgo biloba in Smooth As Silk&trade; Deep Moisture Shampoo 8.5 fl. oz from Giovanni Cosmetics&reg; may provide necessary fatty acids&sbquo; vitamins&sbquo; minerals&sbquo; and proteins to your hair to combat hair fall and frizz. These statements have not been evaluated by the Food and Drug Administration (FDA). These products are not meant to diagnoseÃ¢ÂÂ treat or cure any disease or medical condition. Please consult your doctor before starting any exercise or nutritional supplement program or before using these or any product during pregnancy or if you have a serious medical condition. 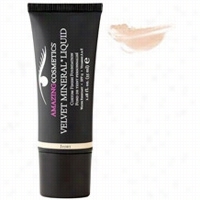 Amazing Cosmetics Velvet Mineral Liquid Custom Finish Foundation Fair 1.18oz. This water resistant, buildable formula allows the user sheer to full coverage. Translucent mineral base cushions the skin, while lightweight pigments blend seamlessly for customizable coverage. 5-in-1 Formula improves skin's appearance and skin's health. Contains over 80 Essential Vitamins and Minerals that nourish the skin for visibly improved tone and increased radiance. Benefits: Safe For All Skin Types. Eliminates the appearance of pores and fine lines.Formulated with antioxidants and contains SPF15 to protect the skin. 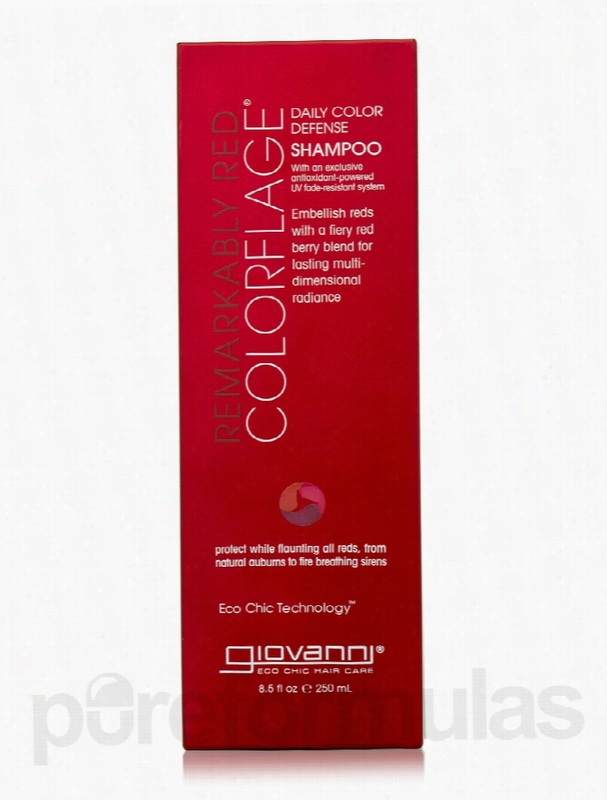 Giovanni Cosmetics Hair - ColorFlage Remarkably Red Shampoo - 8.5 fl.. Discover the heat within red hot hair.Remarkably Red Colorflage&reg; Shampoo revitalizes red for a long-lasting color and super-sleek shine&sbquo; naturally. A brilliant-berry-cocktail of Goji&sbquo; Pomegranate and red-rejuvenating Cranberry synergistically combine with other powerful ingredients to fire combine with other powerful ingredients to fire up high-watt red for shades that radiate.Protect. defend. Shield. Restore.Product Highlights:1. Protect: Exclusive UV fade-resistant system shields hair&sbquo; maintaining color vibrancy and integrity.2. Defend: Super silicones seal in high-watt shine while defending hair against thermal damage.3. Shield: Nourishing&sbquo; antioxidant-powered conditioners shield against color wash-out.4. Restore: Enriched color locking lather prevents color stripping while smoothing rough&sbquo; porous strands to restore hair strength.Eco Chic Technology: the elements of earth&sbquo; wind&sbquo; fire and water represent a unique combination of certified organic botanicals and incredible style. These statements have not been evaluated by the Food and Drug Administration (FDA). These products are not meant to diagnoseÃ¢ÂÂ treat or cure any disease or medical condition. Please consult your doctor before starting any exercise or Nutritional supplement program or before using these or any product during pregnancy or if you have a serious medical condition. Amazing Cosmetics A Little Amazing Tan 0.2 oz. Tan - Ideal for golden olive skin tones.Say "Au revoir" to dark circles, blemishes, sun damage, broken capillaries, redness and more.Perfect for travel, this smaller version of the popular Amazing Concealer is a highly pigmented, super emollient waterproof formula that blends seamlessly into the skin, creating a flawless complexion that looks and feels natural. This concealer erases dark circles, blemishes, broken capillaries, sun damage and redness with only using tiny amounts of product.Called the "magic eraser" by Beauty insiders, Amazing Concealer will transform your skin... into Amazing skin.Directions For Use:Less is more with the Amazing Concealer. Only tiny pin-dots are needed to erase imperfections. Apply tiny pin-dot amounts onto skin and tap gently until well blended. 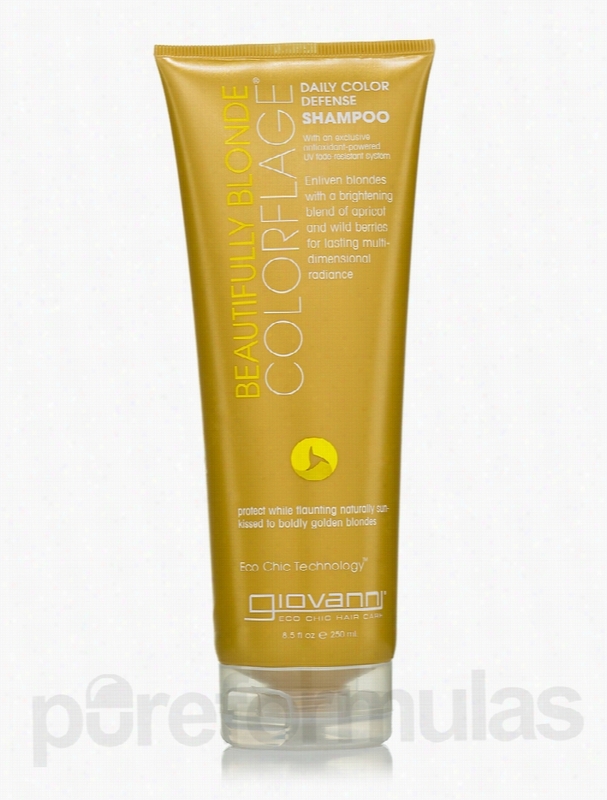 Giovanni Cosmetics Hair - ColorFlage Beautiful Blond Shampoo - 8.5 fl..
Dazzle by day&sbquo; light the night.Beautifully Blonde ColorFlage&reg; Shampoo illuminates diverse shades of blonde for long-lasting color and super-sleek shine&sbquo; naturally. A brilliant-brightening-cocktail of Goji&sbquo; Apricot and restorative Wild Rose Berry synergistically combine with other powerful ingredients so diverse shades intensity to dazzle by day and light the night.Protect. Defend. Shield. Restore.Product highlights:1. Protect: Exclusive UV fade-reistant system shields hair&sbquo; maintaining color vibrancy and integrity.2. Defend: Super silicones seal in high-watt shine while defending hair against thermal damage.3. Shield: Nourishing&sbquo; antioxidant-powered Conditioners shield against color wash-out.4. restore: Enriched color lacking lather prevents color stripping while smoothing rough&sbquo; porous strands to restore hair strength.Eco Chic Technology: The elements of earth&sbquo; wind&sbquo; fire and water represent a unique combination of certified organic botanicals and incredible style. These statements have not been evaluated by the Food and Drug Administration (FDA). These products are not meant to diagnoseÃ¢ÂÂ treat or cure any disease or medical condition. Please consult your doctor before starting any exercise or nutritional supplement program or before using these or any product during pregnancy or if you have a serious medical condition. 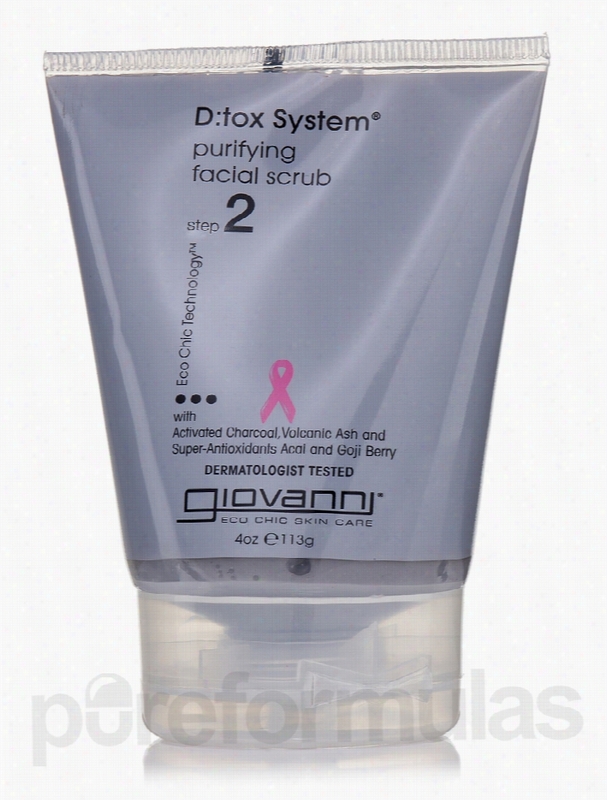 Giovanni Cosmetics Skin Care - D:tox System Purifying Facial Scrub. D:tox System&reg;: purifying facial scrubStep 2In order to help your skin to be pure and detoxified&sbquo; you need this gentle exfoliating scrub. With volcanic ash to dislodge pollutants and activated charcoal to extract impurities and help detoxify skin&sbquo; without drying. Super-antioxidants acai and goji berry help recharge cells. Leaves your face buffed and smooth. pH balanced. For all skin types. These statements have not been evaluated by the Food and Drug Administration (FDA). These products are not meant to diagnoseÃ¢ÂÂ treat or cure any disease or medical condition. Please consult your doctor before starting any exercise or Nutritional supplement program or before using these or any product during pregnancy or if you have a serious medical condition. 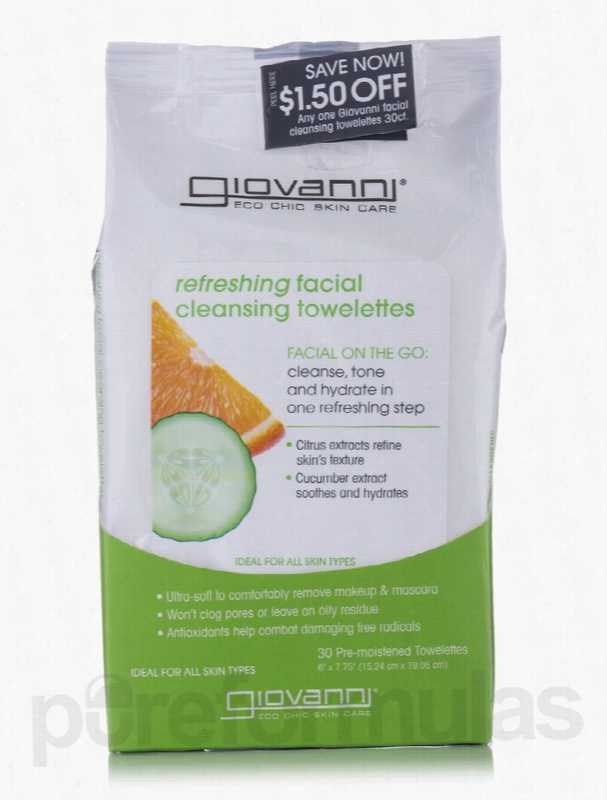 Giovanni Cosmetics Skin Care - Refreshing Facial Cleansing Towelettes. It's always go&sbquo; go go. Steal a moment with this multi-tasking towelette. It goes to work for you&sbquo; sweeping away dirt&sbquo; oil and even stubborn makeup. Breathe in the refreshing botanicals. Orange&sbquo; lemon and grapefruit extracts aid in refining skin's texture&sbquo; then help combat skin-damaging free radicals with antioxidants.Cucumber extract delivers a calming dose of hydration. And you score a facial on the fly.Refreshing facial cleansing towelettes.Facial on the go: Cleanse&sbquo; tone and hydrate in one refreshing step.Product Highlights:1. Citrus extracts refine skin's texture.2. Cucumber extract soothes and hydrates.3. Ultra-soft to comfortably remove makeup &amp; mascara.4. Won't clog pores or leave an oily residue.5. Antioxidants help combat damaging free radicals. These statements have not been evaluated by the Food and Drug Administration (FDA). These products are not meant to diagnoseÃ¢ÂÂ treat or cure any disease or medical condition. Please consult your doctor before starting any exercise or Nutritional supplement program or before using these or any product during pregnancy or if you have a serious medical condition.